Vincent John Hewitt - My great-great granddad, Cain Hewitt, died at Lidgett Pit in 1894, I would love to write a short book on the colliery and maybe a few others. John Rigley - My uncle, Gershom Rigley, lost his leg as the result of an accident with a pit pony. The Duchess of Portland asked the doctors to check his leg, they amputated it? Since last year I have been researching my family history. All my relations bar myself and my father had been born and lived in Yorkshire. Through my searches I noted that every one of my relations on my father's side worked in the mines and I started to read up on what life in the mines was like. Everything about the mines has captivated me and as a part time writer, when work and family allow, I am longing to put to paper a piece of my own. With the vast number of mine's it's hard to know where to start. But then I came across a missing piece of information. My great-great granddad Cain Hewitt died in 1894 and purely by chance while looking on your site I found him under fatalities. He was crushed by tubs at Lidgett on the 31/07/1894. I know little if anything about Lidgett but would love to write a short book on the colliery and maybe a few others. My question is if you or any others could aid me by either giving me a background on the pit or a point in the right direction to any literature. Any one who may have worked at the colliery would be an invaluable asset but I am not aware of any contacts. I must add that I self publish and on this project I only wish to recoup only the publishing cost so would willingly donate all further profit to any that befits you and the mining industry. I contacted you last year while researching my great-great grandfather Cain Hewitt who died at Lidgett mine Elsecar. While doing further research I have found on your database, E Hewitt who died at the same location in the following year 1885 from a fall from the roof. This young man is my great-great grandfather’s son Edmund. At the time of his death according to his burial records he was about 15 years of age (The exact words used on the records), he was born in 1880. I have attached a copy of his Burial record, and strange as it is he was buried on what became my birthday. You information on the database was a great help to me as it gave a date for the accident and has given me a great starting point, thank you. My brother was ......Gordon (Sonny) Vincent Bough killed 15 Mar 1956 ... Surname has no ..r. ..its. BOUGH others details are correct . To all family members he was known as 'Our Sonny' My mum said when he was born she said to everyone "This is our Son" which soon became 'Our Sonny' As my dad was also called Gordon, this helped who answered to Gordon. His anniversary, 60 years this year. Still heartbroken, I was just 11 at the time. The single most devastating blow of my life. My uncle, Gershom Rigley, lost his leg as the result of an accident with a pit pony. The Duchess of Portland asked the doctors to check his leg, they amputated it? I had an uncle Gershom Rigley who lost his leg as a result of accident with pit tub and troublesome pony I think he may have been 14/15 at the time. My dad told me he was seen by the Duchess of Portland when she visited the hospital and he told her his leg smelled funny it was gangrene of course and she asked the doctors to check and it was amputated. No idea if true or date but hope this may be of some interest. 21/01/1945 Leonard Schofield / Hickleton Main / cause of death = Fall of roof. I am currently researching a family named Furness and in particular a miner called Robert Walter Furness. He was involved in a mine roof collapse at the Houghton Mains Colliery in January 1935 but survived. However, a colleague, George Laycock, was killed as reported in the Yorkshire Post and Leeds Intelligencer on 19th January 1935 ("Miners Entombed by Roof Fall"). You may wish to check this out and add the name of George Laycock to you website. Finally I am trying to find out if there was an enquiry as a result of this death and would appreciate if you are aware of inquest or enquiry. Joseph Evans is almost certainly my Great-Grand-Uncle born 1856, died 25 July 1910 in Whiston (Rotherham). More detail if wanted. Maths makes my Joseph 54 years old at death, not 51. Fully appreciate source data may be wrong and that typos occur, especially when dealing with lists. Manuscript ones compound and 4 can look like a long lead stroke 1. No criticism, just possibilities. Can I take 21-Jul-1910 as the date of the explosion, not the fatality? 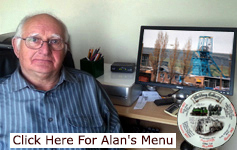 Praise to all involved for a fine, factual and surely worthwhile website . born 1856, Coleorton, Leicestershire, first eight children of John and Susannah Evans (nee Bradford). 1871 census and on: Coal miner. 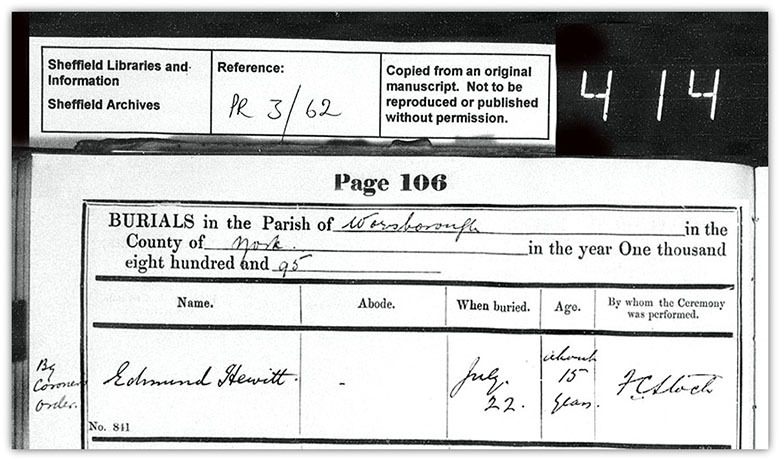 1878 Sheffield registered marriage to Eliza Bartholomew of Mosborough, producing four known children. 1881 Census residences: 43 Stanton Hill, Skegby, Nottinghamshire. 1901, Toll Bar House, Whiston. 1910, Interred in Whiston churchyard (photo). In return feel free to use words and image. And on a lighter note, if considered appropriate, two wryly humorous anecdotes showing the miner’s laconic approach to fact, plus a probably unforeseeable workplace hazard. Source: my father, Arthur Briggs, Deputy Shotfirer at Arkwright Colliery until 1973. I don’t recall when he told the tale, but it was the later 1960’s when car ownership was uncommon. If I remember rightly he called the miner Jim. Source: [name withheld], a corporal I knew in the RAF circa 1978. He had a couple of years in a Doncaster area pit before joining up, so his tale is of similar 1960’s date. One Harry, I think, was the subject. Harry, like many, was a smoker and chewed tobacco underground. Routinely, though, he lit up for a last drag while waiting for shift start companions. This often meant half a cigarette, which he’d pinch out and stow in his locker. As was his wont, on surfacing he’d strip pit tackle off, light his dog end and sit naked with it on a nearby lath bench before showering. So he sat on this occasion, leaning forward, elbows on knees, enjoying the smoke. Unrecognised by him, though, his balls dropped into a lath gap. Harry, smoke finished, heaved himself upright and passed out. Apparently he was still tender after a week off work. Thanks also for email address confidence, however I’ll happily respond to any legitimate enquiry. Research difficulties appreciated, so respect to all involved with an intelligent public serving website, a breath of fresh air among so much commercial mediocrity. 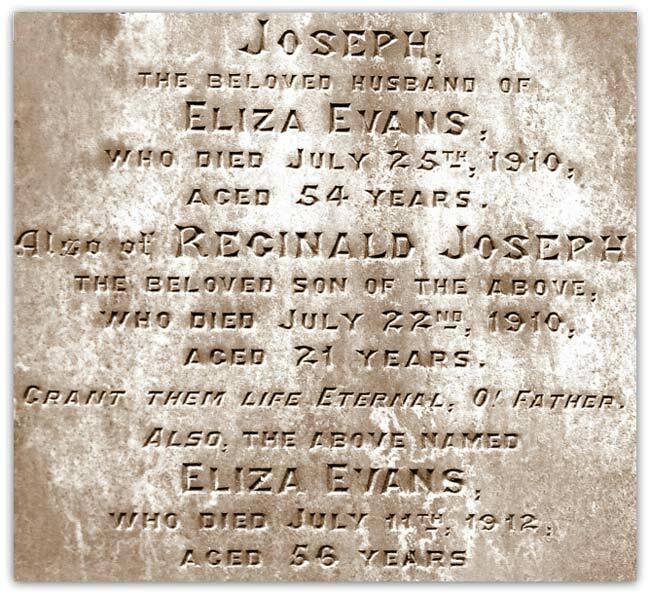 Joseph Evans was 54 when he died as the result of a explosion on the 21st July 1910 at Rotherham Main Colliery, owned by John Brown and Co.
Three men died, Joseph Evans, Reginald Evans and Albert Fletcher. They were working in a long-wall face. Joseph was setting a prop when a large stone fell from a cavity in the goaf, knocked out a prop and smashed a safety lamp. The fall brought down firedamp from the cavity and a sharp explosion resulted. All the men were so severely burnt that they subsequently died, so not necessarily on the day of the accident. Hi Fionn, The HMI report gives his age as 54 also on Free BMD as 54. Can you please look to find my great grandad killed underground 1931- 1935 in Derbyshire coal mine his name was Thomas Mills on my dads birth certificate it says he was a coal face machine driver. My dad was only 3 or 4 when his dad Thomas was killed. The only Thomas Mills I can find died at Frickley Colliery in Yorkshire. He was 21 and died 3 Jun 1933. He was an Underground fitter and was travelling outbye on an endless rope haulage road and was found lying in a full tub track, his lamp was found on a set 30yds away. Presumed to have been riding the endless rope. Died ten and half months later.